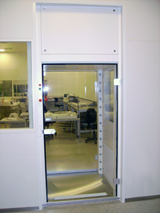 For the safe introduction into the clean room, the active persons air shower is an important component. 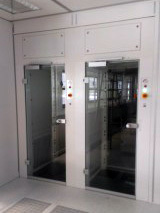 The personal air shower minimizes the particles on clothing or on materials so they are not introduced into the clean room. Cross contamination is avoided. To overcome the adhesive forces of the particles, the persons or materials are blown with high-energy air jets (about 25 m / s), then the dissolved particles are removed and the persons can enter the clean room. You thereby guarantee the customer-desired product protection within the intended system. In addition, the integration of an ionization device can significantly reduce the electrostatic adhesion forces of the particles and increase the cleaning effect. Our air shower for people is powered by a high-performance radial fan in the drive module above the air shower. The fan draws in the air via the two intake ducts delimiting the common room and blows the air via HEPA filters into the corner ducts, each equipped with 14 nozzles. The arrangement of the nozzles creates a vortex-shaped rotational flow, in which the air volume flow effeciently detaches the particles and separates them via the integrated filters. 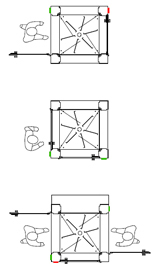 Standard sizes [WxDxH] 1,200 x 1,200 x 2,800 mm. For low room heights, a variant with a height of 2,500 mm is also available. Our air showers are 2-door and 3-door available. Special sizes eg as a material lock are possible at any time.